Gas utility UIL Holdingswill pay a second-quarter dividend of $0.432 per share, the same rate it's paid for the last four years,since it reinstated the dividend in 2009, the company announced yesterday. The quarterly dividend is payable on July 1 to the holders of record at the close of business on June 17. UIL had suspended its dividend in 2006, when it was paying $0.72. The regular dividend payment equates to a $1.73-per-share annual dividend yielding 4.3% based on the closing price of UIL Holdings' stock on May 14. UIL Dividend data by YCharts. 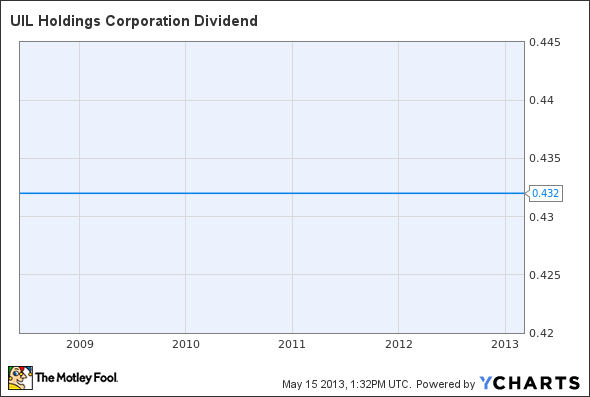 The article UIL Holdings Keeps Dividend Steady originally appeared on Fool.com.